← ArchiMate 3.0: What is the preferred way to model a Server Farm? Question: What is a useful metric for the dimensions of the Enterprise Architecture Chasm? It would be interesting to correlate the EA Chasm metric with measures of “business success” (e.g. Y/T growth, revenue, profitability, revenue per employee, …). It would also interesting to see where companies Uber, Airbnb, Alibaba, Spotify, and Facebook are placed on the graph. Presumably, these are low EA Chasm companies. I’d suggest that, first off, the chasm between strategy and action exists without there being an EA model in the middle. While the two chasms you reference do exist, I’d suggest that they exist in parallel, or perhaps as a triangle, and not as a single straight line. Secondly, I’ll attempt to answer your question. You ask if IT4IT or BizBOK can address these chasms. In the first case, no. In the second case, the attempt of the BizBOK is to answer the chasm that I mention above: the chasm between business motivation and business reality (without EA in the middle). That is certainly the more pressing and visible problem. RE: While the two chasms you reference do exist, I’d suggest that they exist in parallel, or perhaps as a triangle, and not as a single straight line. Thank for your feedback Nick. The thought it invokes is: To what extent (wholly or partially) is Strategy represented or manifested, perhaps ideally, via the Enterprise Architecture model? Today, in most organizations, it’s not 100% and likely will never be close to 100% …so yes, another chasm does exist. 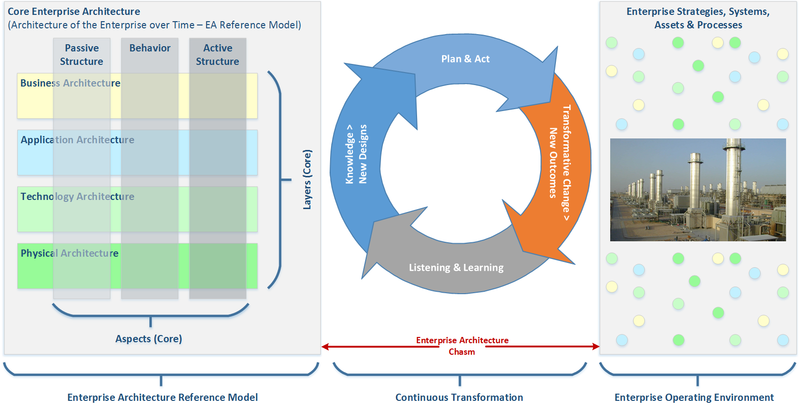 The Progressive Enterprise Architecture Model and the Continuous Transformation Framework can be easily generalized to support Wearable/IoT feedback loops: subjects on the right; model of the subjects on the left.